I'm baaa-ack. It's only been like a day and I'm itching to write another post, but I have no idea what to write it on. So you might be in for some more rambling. I apologize in advance. So first things first, are you a follower on Instagram? If not, you should be. Search up thethriftedhouse so you can see some of my peectures. Still learning how to edit them how I want, but I've been having fun learning. I'm gonna be a regular iPhoneographer before you know it. I've been taking pictures of some of my favorite Fall items displayed in my house ( which are posted on Instagram, but you probably already know that, because your following me now, right? ) One of my favorites is my serving tray decor on my table. The cute owl/ and pumpkin salt and pepper shakers. Which were given to me by a friend for my birthday a couple years ago. ( Hi Autumn! ) Aren't they darling? I have a hard time decorating with color, because I'm boring and my favorite colors are white and gray. I could decorate all day long with those 2 colors. Which is funny, because I love Fall and all the Fall colors. Go figure. But lately I've been trying to expand my color horizons, and diving into the world of GOLD. I use to dispise gold. Hated it. More so, the funky gold hardware on outdated fixtures. But wouldn't you know, if you wait long enough, something comes back into style? I'm currently working on decorating the family room in Gold, Gray, and White. Told you I was expanding my color options. Pictures to come soon. :) But i'm getting ahead of myself. Here's the cute serving tray with the salt and pepper shakers. The name of my blog is The Thrifted House, so I should probably show some thrifted treasures. :) The next photo is of a cute little vignette that I have going on in my entry way. The white pumpkin is from the Dollar Tree, and the glittery pumpkins in the jar are from Family Dollar. That jar was a great find at Goodwill! It has a sibling and it is a bit larger, but with a green lid. LOVE them. And the books are from a local thrift shop here in town. I love buying old books. So many uses for them! You can use them as decor, or cut the pages out ( GASP!) for a craft, ( more on that later). I especially like the old hardback reader digests, because they come in pretty colors. :) The scale is from an antique store over on the coast. It was a little more pricey than what you would pay for thrifting, but I had to splurge. I've always wanted one. And lastly, a little Fall display on my coffee table in my Living Room. This is the room that we really don't hang out in much. So this is where most of the decorating happens. It could be a game changer when S starts walking. But I'll cross that bridge when we get there. The letter J and greenery are from Michaels. I believe I bought them on clearance. Score! And of course, I have to have my books. The J and white pumpkin ( also Dollar Tree) are sitting on a stack of vintage hardback books, wrapped in twine. Because twine makes everything better. Oh and that basket was from good ole Tarjay! Also a clearance find. 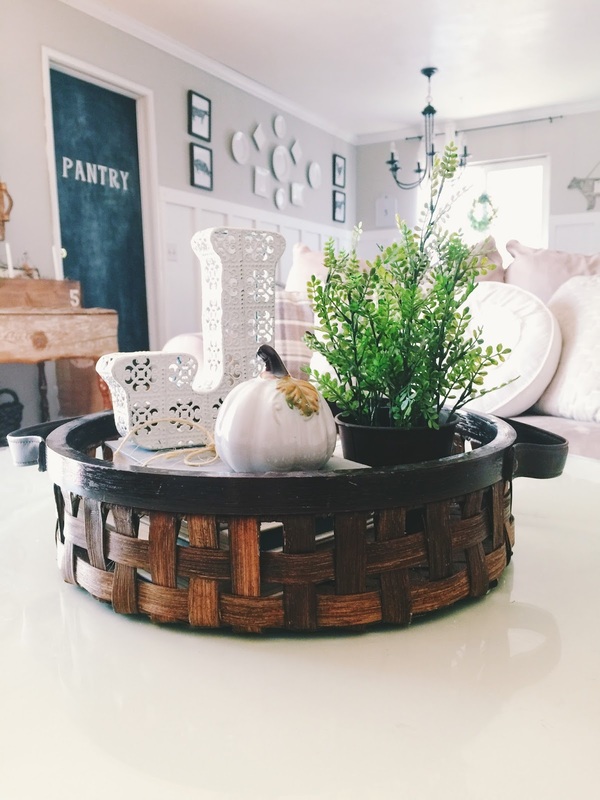 More of my Fall decor to come. Mr. S. has decided to wake up from his beauty sleep, err.. manly sleep? So I best go get him. Until next time.